Happy beginning of summer! I am so glad to be bringing you this month's special because I know how busy your life is during the summer. During our June promotion, everyone gets to try Studio J FREE! Simply create an account, build a layout, and order your FREE JPG file. There is no software to download. Simply start at Studio J on my website. From there, you can post it on your blog or facebook page, send it to family and friends or even have it printed. It's so easy!! I am having 4 FREE classes to help you try it out. Simple bring your laptop (that has pictures loaded - or I will even teach you how to load them! ), and I will walk you through the entire process from beginning to end. Please RSVP by one hour before the date of the class at (763) 227-0583 or girlygirlrose43@msn.com to let me know that you will be attending. I will also provide goodies and beverages. 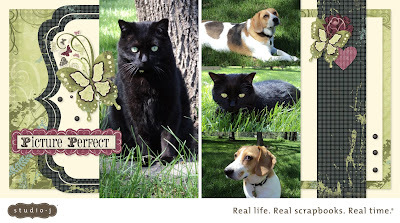 I have to tell you a little something about Studio J. I am on a hands-on scrapper. I love the feel and touch of product in my hand. BUT, I have found a great love for these digital layouts as well. When I received my first ones, I was in awe of the quality - and just how beautiful they are. I hope that you are able to attend a workshop so that I can show you Studio J! RSVP by June 10th to reserve your spot! Class size is limited, and I only have 4 spots left. Should you need any supplies, let me know when reserving your spot, and I will order them for you so that you have them the night of the workshop. 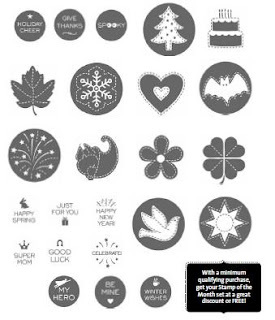 This is a versatile year round stamp set that will work very well for your cards or pages! 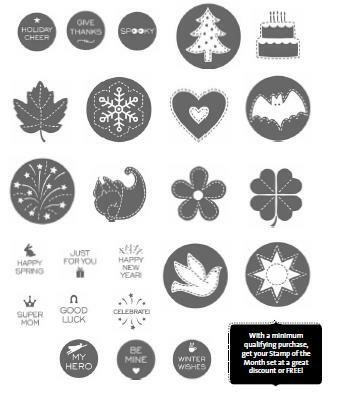 You can earn this stamp set discounted or even FREE! Hold a Gathering or Workshop with me during June, July, or August that totals $250 in sales, and you will receive an extra $20 in select product of your choice as a gift from me! Gatherings should be fun and flexible, and I want to meet your needs. There are several types of Gatherings that you can have, and we can discuss what would work best for you. Even if your Gathering is online, you have a fabulous opportunity to earn FREE product this summer! You can shop 24/7 on my website! Have you been there lately and seen the "While Supplies Last" tab? Simple click on the Shop Online tab and at the bottom you will see the sub-header for "While Supplies Last." This is an amazing assortment of discounted products that are being sold for deep discounts. Close To My Heart adds to this list frequently so check back often! For every $25 you spend, you get a punch on your Frequent Shopper card! Once you have 10 punches, you will receive a free stamp set from me! Be sure to ask me for your card next time you see me!